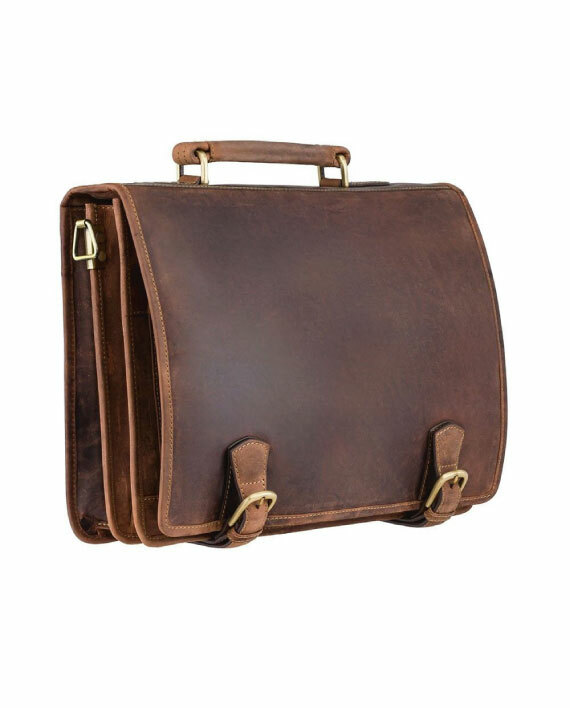 The “Hulk” oiled leather briefcase is perfect for someone who needs lots of space for tech and paperwork. 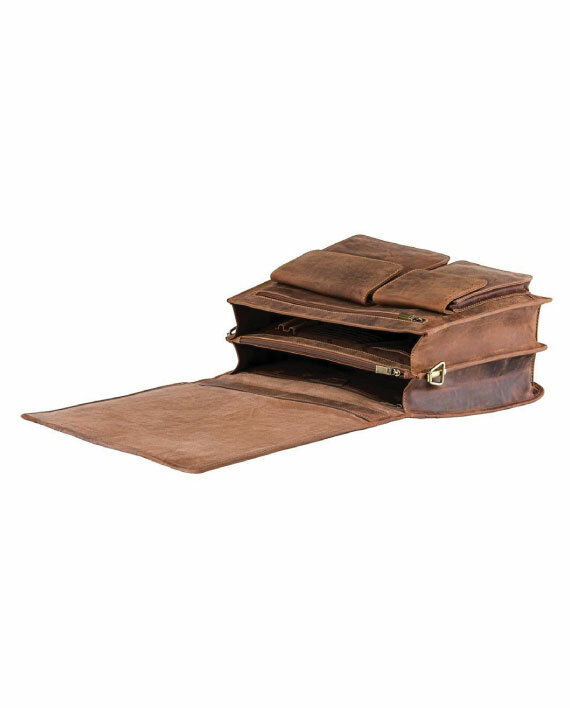 Manufactured from premium oiled leather it provides the ultimate carrying solution. This product is manufactured from premium oiled leather. This leather has an aged appearance and will further age and take on a distressed look. No two oiled leather products will ever be the same shade or develop the same patina due to the natural properties inherent in natural leather. We like this. This bag does not need any type of protective treatment on arrival. : Detachable adjustable shoulder strap. : Measurements 35cm x 43 cm x 12cm. : Closes using secure press stud closures. I’ve meant to leave a review for months but never got around to it. long story short, buy this bag. Its more beautiful in real life than any picture can do justice. People tell me constantly how lovely it is, and I can only agree. For the money and the speedy delivery its honestly a no brainer. I cary two laptops and the rest in this every day and its never given what to the weight. Im honestly shocked that its as cheap as it is. I’ve been using this bag every day since last Christmas and it still shows no signs of wear. It is easily the best bag I’ve ever owned. Love it! Bought the bag for my son, beautiful finish and a great price,delivery was excellent and he loved it, going to get my daughter the female version now. I bought the hulk as a gift for my husband. It’s a beautiful product , good size for laptop etc. The service was very good. This is the 3rd time I’ve bought from this company and have not yet been disappointed. 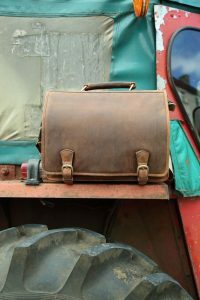 After an old briefcase of mine finally gave up, I was looking for a cross between a leather briefcase and dispatch type bag. I wanted something with a reasonable capacity, specifically able to hold 2 x A4 ring binders for legal documents, along with my iPad mini in its case, a few pens, a notepad and sundry small items. Having purchased a Hulk briefcase I’m incredibly pleased! The design is the perfect size for my requirements and fits everything I needed with room to spare. The quality of the stitching and furniture is outstanding and I’m particularly impresses with how sturdily the carrying handle and the shoulder strap anchor points are attached to the bag – I fully expect to get years and years of busy use from this bag. Finally and best of all is the quality, finish and smell of the leather. It has a wonderful aged look, exactly as described, and if anything looks even better than it does in the photographs. It also smells wonderful! The bag certainly isn’t cheap but given the amazing quality of the design, materials and construction I think it’s excellent value for money as I’m sure it will last very well indeed and provide years of faithful service. 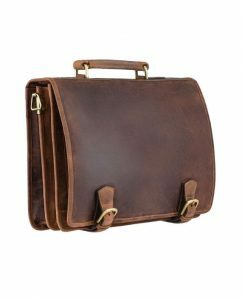 I’d unhesitatingly recommend this briefcase to anyone looking for a not-too-large leather dispatch bag / briefcase type bag. Absolutely superb. 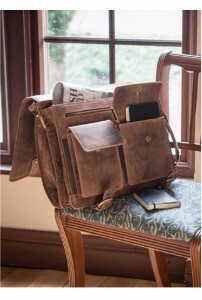 Lovely bag – really enjoying it… also it was shipped quickly and I was able to start using it ASAP. Things I like are the size (fits my laptop, power supply, books, iPad, papers etc), the nice look of the leather, the strap for over my shoulder etc. I did considering taking away a star as the clasps can be hard to to close – they can be a bit fiddly to open and close, but I guess that is good security as it makes it tougher for someone to reach into my bag! So overall, very happy and I would recommend to buy! 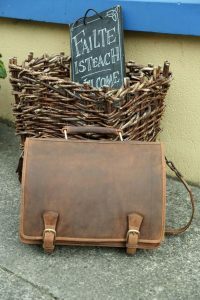 Delighted with briefcase exactly what I was looking for. Really good customer service, delivered in a timely fashion. I am the proud owner of a Hulk since April (named Mála – I know, not very imaginative, but it fits). 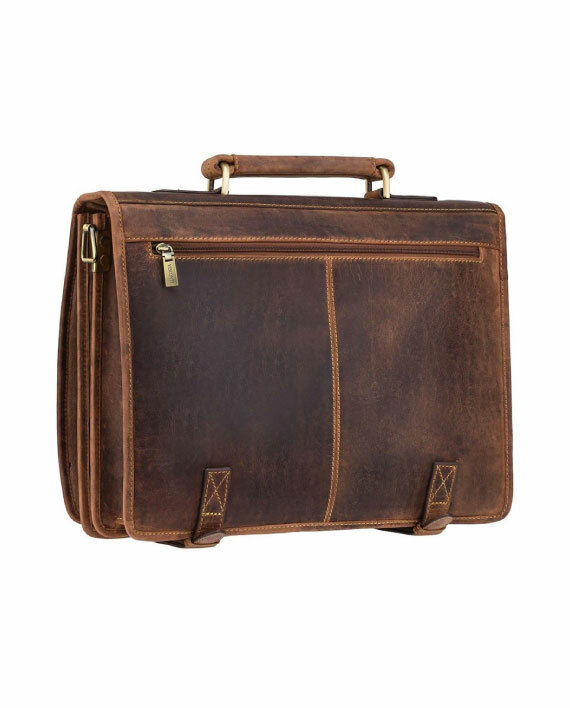 I had struggled to choose between the various briefcase/laptop cases so I opted to purchase in store, but I would have absolutely no qualms about ordering online as the service was first class and I could see that all of the products stocked were of the same high quality as this. The design of the Hulk itself is spot on; Visconti obviously know their stuff when it comes to bags, and there are a multitude of pockets and zipped sections of varying sizes, perfect for the paper basics as well as all the modern technology requirements. The faux buckles at the front are both stylish and totally practical, and the magnetic clasps on the front pockets just as practical too. Mála has travelled about 40,000km around the place so far (several trips to US, and also to Denmark, Germany and Spain) and is really doing a great job, carrying an unreal amount of gear, but still looking neat and unfussy, getting compliments along the way wherever I may be. What I really love about it is the way the leather has started to weather and tell its own story (the side closest to the body is picking up a sheen, and the outside has a few scuff marks); this was actually the key selling point to me choosing this model over the others – what was really useful was to be able to see a year/two-year old version of some of the bags to get a feel for how they would age, and develop character. Oh, and it still smells wonderfully leathery! Delighted with my purchase. Ordered it on a Friday and it was delivered in Dublin by the next Tuesday. It looks, and feels, fantastic. It’s also a really great size, not too bulky but with plenty of room. I bought the Hulk for my husband, as he wanted a grown-up, leather laptop bag that could hold some extra stuff, but wasn’t too ‘briefcase-y’, and this perfectly fits that description. Although, it’s hard to tell exactly what the front of the bag looks like from the photos, it has a grown-up ‘satchel’ look which is professional-looking, without being old-fashioned, and inside it has lots of space, without being overly bulky to carry. As others have said, the leather is even more beautiful in reality and it has that ‘real leather’ smell. My husband has received many compliments on it, and it is noticed wherever he goes. For the price, it is outstanding. The ordering process was easy – delivery arrived within 2 working days. Perfect! I love this bag. Don’t let the name fool you, The Hulk doesn’t look as bulky as the name suggests. It’s beautifully sculpted, and magically, just does not fill up. It’s the Tardis of bags. I can fit TWO 15″ laptops, 2 chargers, an iPad, a couple of external hard drives, notebooks and still have room for more. I couldn’t be happier, it’s just superb. 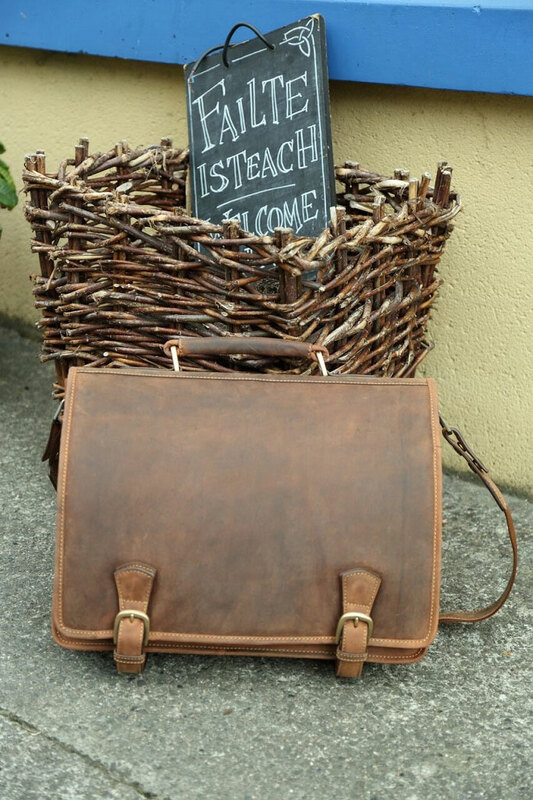 Great bag with ample storage, and made to a very high standard. 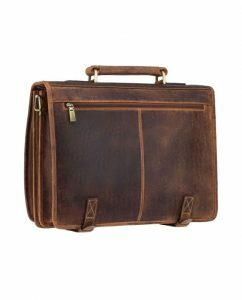 I would highly recommend if you’re on the look-out for a professional and stylish laptop bag. Excellent bag, well made and perfect for work. Good service too. Don’t have a bad word to say. Have had my hulk briefcase for roughly a year now and shows no signs of wear or issues. Looks fantastic and is highly functional with plenty of space and useful compartments. Service was also top quality especially when I had some follow up questions. Would definitely recommend. Excellent case, fits everything and sturdy. Love it. Excellent service and quality is outstanding. Next day delivery arrived on-time, well packaged. Was amazed by the quality of what I recieved. You will come across other products that are twice the price and half the quality! Bag an excellent size for 15 inch laptop and all else you need when on the go. Excellent quality. Fits my 15″ Macbook Pro and lots else too. Looks the part and has a very ‘premium’ feel to it. Wanted a Visconti case from MalaGalway for around 9 months. When I received my Hulk case I was certainly not disappointed. The quality and service are top class. Highly recommended!